Though unbeaten four-weight champion and current pound-for-pound star Mikey Garcia continues to call for a massive, and massively risky, welterweight fight with Errol Spence – a fight that, should he win, would see Mikey make history – there are plenty of people who feel the WBC/IBF lightweight ruler should instead take a fight closer to home. 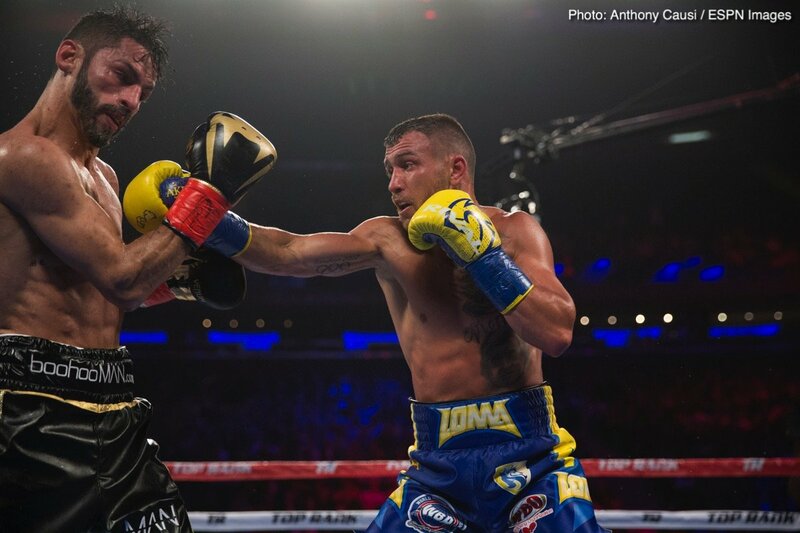 Bob Arum included, plenty of people want to see Garcia face the mighty Vasyl Lomachenko in what would be a massive WBC/IBF/WBA/Ring Magazine 135 pound unification showdown as well as a battle between P-4-P entrants (the currently inactive Lomachenko, recovering from shoulder surgery, being ranked at No-1 in the opinion of most everybody). But, according to Arum (and others) Garcia is “afraid” of facing the southpaw from Ukraine and is looking to take on Spence in a fight that, should he lose, no-one would really hold it against him seeing as how the IBF welterweight champ is so much the bigger man. Which fight would YOU prefer to see: Garcia-Spence or Garcia-Lomachenko? Both fights would be big, big, big, with the former seeing Garcia “dare to be great,” as Spence put it recently, while the latter would see Garcia match his skills with the most naturally skilled operator on the planet. Arum says a fight between his man Loma and his former fighter Garcia can be made, if Garcia wants it. So, is Arum right, is Garcia using the Spence fight as a means to avoid a fight with Lomachenko, or is this line of thinking a piece on nonsense? In truth, whichever fight Garcia takes – Spence or Lomachenko – he deserves much praise. Both are very tough fights, even for as special a fighter as Garcia, and we fans will settle for seeing either one. Or maybe, just maybe, we will get really lucky and get to see Garcia fight Spence AND Lomachenko! Now that would be something, as well as a smack in the teeth for all Garcia’s critics. Previous boxing news: Video: What’s next for Mikey Garcia?